NiMH rechargeable: 200 treatments (16oz./0.5L) or 100 treatments (32oz./1L). Treatment Times: One half liter of water is purified in 48 seconds; One full liter of water is purified in 90 seconds. The package includes the SteriPEN Classic 3 water purifier, Pre-Filter with Nalgene bottle adapter, Filter Cartridge, carrying case with belt loop, and user's guide. 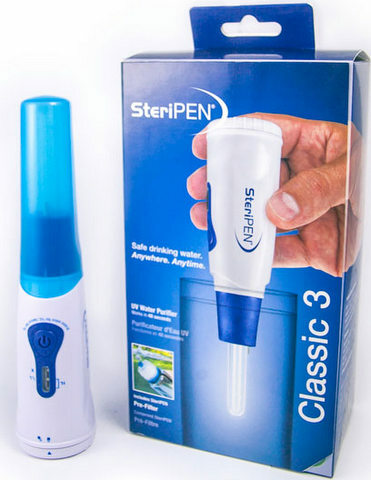 The original SteriPEN handheld UV water purifier has been improved for this Classic 3 version that includes a Pre-Filter to remove particles from the water prior to activating the SteriPEN. The Classic 3's UV light destroys over 99.9% of waterborne microorganisms that cause illness. The Classic 3 is the first version of the SteriPEN that can operate with one set of 4 AA alkaline batteries that were not included in the package. It can also be powered by alkaline, lithium, or NiMH rechargeable batteries which the manufacturer recommends for longer battery life. The Classic 3's enhanced LED indicator panel shows the treatment size and status of batteries and UV lamp. The Classic 3 is ergonomic with an easy-to-remove twist-off lamp cover. To use the Classic 3, remove the lamp cover, press the activation button, submerge in clear water and stir. When the water sensor pins detect water, the lamp will illuminate. When treatment is complete and successful, the lamp will turn off and green LED indicators will flash when water is safe to drink. The 40�40 micron screen Pre-Filter fits perfectly on wide-mouth one liter water bottles and removes particulates that can get in the way of UV light in water. The Pre-Filter is designed to be stored directly on a wide mouth bottle and the SteriPEN Classic 3 fits perfectly in the filter. The Pre-Filter that is screwed onto the top of the Nalgene bottle can be left on the Nalgene bottle for the entire trip. The small tube portion that is inserted into the Pre-Filter must be stored elsewhere during the trip. The small tube portion that is inserted into the Pre-Filter contains mesh to keep debris out of the water bottle during the filling process. The blue mouthpiece on the top of this part of the Pre-filter is not meant to be used as a mouthpiece to drink the treated water out of the Nalgene bottle because untreated water would be on the outside. The blue mouthpiece pulls up to open which allows the bottle to fill with water faster. The manufacturer provides a three year limited warranty. The instructions indicate to treat water in one-half or one liter batches. The instructions also do not recommend using alkaline batteries because of their short lifespan. Batteries should not be left in the SteriPEN for extended periods of time. With a lamp life of up to 8,000 liters, the manufacturer indicates the Classic 3 should purify drinking water for over 7 years. To use, install the Pre-Filter base on top of the Nalgene bottle and install the Pre-Filter mesh cartridge. Submerge the bottle in the water source until bottle is full. Once the bottle is full, remove the Pre-Filter cartridge, remove the lamp cover, press the activation button once for a half-liter and twice for a full liter treatment. The LEDs will flash green to indicate the unit is ready. Insert the SteriPEN in the Pre-Filter base opening until the sensor pins touch the water or turn the water bottle upside down. It is important that the blue soft plastic portion of the Classic 3 fit snugly in the water bottle when turning it upside down to prevent leakage. The tapered end of the Classic 3 also fits snugly in some plastic water bottles. When the pins detect water, the lamp will illuminate. Stir or agitate the water by rocking the bottle for uniform purification. Once the process is completed, 2 green LEDs will illuminate for one liter of water or 1 green LED will illuminate for 1/2 liter of water. If red LEDs illuminate, that indicates low batteries, less than 100 uses left on that set of batteries, the water sensors were not submerged in water, time to replace or recharge the batteries, water was not detected, or time to replace the LED lamp depending on the pattern of LEDs illuminated. The battery compartment is not waterproof so it is not recommended to submerge the entire pen. 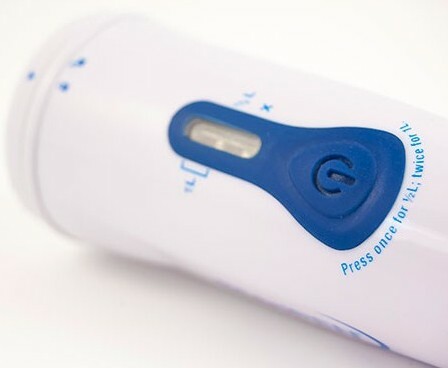 The batteries may be affected by temperatures above 120 F (49 C) and below -4 F (-20 C) and thus the SteriPEN should be kept within this temperature range. To clean the SteriPEN, wash with a soft cloth and mild soap solution, rinse soap from device and dry with a clean soft cloth. If the bulb is cracked, chipped or damaged, return it to the manufacturer for repair. To give it a try, I installed the Pre-Filter base on my Nalgene bottle, inserted the Pre-Filter cartridge, and submerged the entire bottle in a sink of water. Once full, I removed the Pre-Filter cartridge, pressed the activation button twice for a full liter treatment, inserted the SteriPEN into the Pre-Filter base opening and inverted the bottle. The lamp illuminated within two seconds. I rocked the bottle back and forth in a circular motion to agitate the water. Within 90 seconds, the two green LEDs illuminated to indicate the process was completed. The Classic 3 is a compact, lightweight, easy to use tool to obtain drinking water in the backcountry. I can't wait to get it out in the wilderness for the field test. I installed the pre-filter on my half-liter water bottle and obtained water from the lake. I could only reach the water from the edge of the lake and there were small waves so there was silt present in the water. The pre-filter worked well as there was no sediment in my water bottle. I needed to be sure the smaller part of the pre-filter was connected tightly to the large part that screws onto the top of the water bottle. When I first pushed it in, it was not secured well and came loose easily. I was worried that if I didn't screw it in tightly, it might come loose in the waves and float away. Once the water bottle was full, I inserted the SteriPEN unit, turned the bottle upside down and turned on the unit. After swirling the water as directed for 45 seconds, the green light came on indicating the water treatment process was completed. The button activation/warning system works well. I have purified 25 liters so far and have had no issues. I am using rechargeable batteries and am still using the first set of batteries. According to the manufacturers estimate of 100 treatments on one set of rechargeable batteries, I estimate I have another 75 treatments before I need to recharge this set of batteries. That should take me through the end of this test. The start button turns on easily, the lamp activates within a few seconds of sensing the swirling water, and the green lights flash when the purification process is complete. The SteriPEN operates as indicated in the instructions. I have noticed that a few drops of water drip out during the purification process when the bottle is turned upside down while I am swirling the water with the SteriPEN inserted into the prefilter ring. The dark blue portion of the SteriPEN fits snugly against the prefilter ring so I am not sure why water is leaking out. This picture shows me obtaining water from the edge of the lake where there was silt in the water due to the small waves caused by the wind. 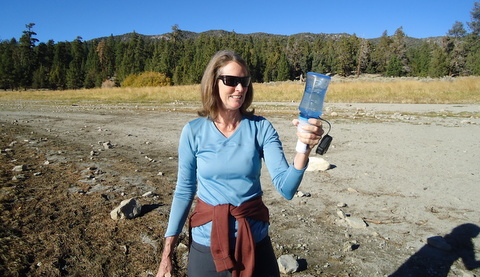 This picture shows me swirling the half-liter water bottle with the unit inserted into the bottle with one hand, thus demonstrating how easy the SteriPEN is to operate. This picture shows how well the pre-filter worked to keep out the silt. The water is clear and has been purified. While the pre-filter ring and mesh parts work well to keep out particles that are present in fresh water sources, they are extra little pieces to carry around. The large ring that screws onto the top of the water bottle is convenient because the top of the water bottle screws onto the top of the pre-filter. Drinking from this ring is not recommended because the water on the outside of the ring is not purified. The little pre-filter part that gets pushed into the ring is another story. It has mesh around the sides and must be kept protected during transport. I am still trying different methods to protect this little part during transport. If my water bottle is empty, then it is a convenient place for storage. Considering I have been using bleach drops to purify my water for the past two summers, the SteriPEN seems like a lot of work in one respect. On the other hand, with bleach, I need to wait an hour for my water to be ready to drink. With the SteriPEN, once the water is purified, it is ready to drink. On a longer duration trip with a lot of streams and lakes available, I think the ability to purify and drink the water all in one stop would be an advantage. Being able to drink a liter or two on a water break would also eliminate the need to carry as much water. 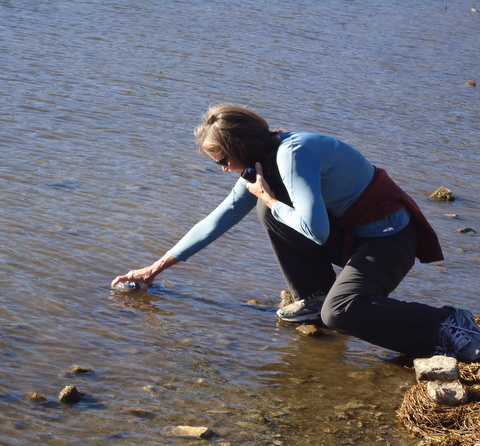 We hiked around many streams and lakes with opportunities to utilize the SteriPEN. I used the SteriPEN for our group and purified a total of 25 liters of water on this trip. This makes 50 total liters of water purified on the first set of rechargeable batteries. The on-off button works easily and the lights on the handle of the SteriPEN continue to work without fault. I located a very small plastic container to store the prefilter in during transport to prevent damage to the small mesh filter portion. This has worked well as there is no damage so far. This SteriPEN was easier to work than I was expecting. I will continue to use this SteriPEN for my future trips. The SteriPEN continued to work well in the field. 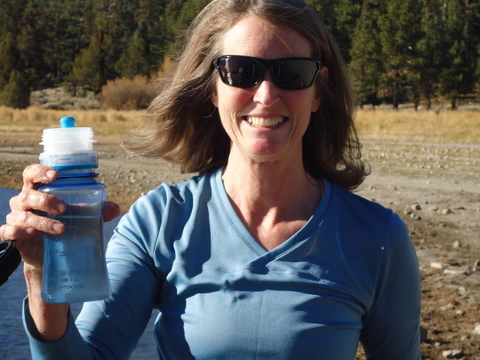 The advantage of being able to drink the water immediately after it has been treated has allowed me to carry less water between water sources. This is a welcome weight savings that is offset by the weight of the SteriPEN. This test series is now concluded. Many thanks to SteriPEN and BackpackGearTest.org for this testing opportunity.